It was originally known as E42 (Esposizione 1942), the name of the district was changed to E.U.R. 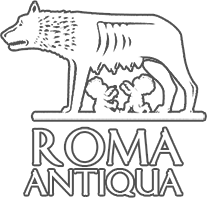 from the acronym “Esposizione Universale di Roma”, and finally in May 1965 it takes the current name Europa, even if being known with the acronym. EUR is a modern district famous for its rationalist architecture, conceived and built on the occasion of the World Fair that would have held in the Capital in 1942, to celebrate the twentieth anniversary of the March on Rome and that didn’t take place due to the Second World War. The architectural design was inspired, according to the fascist ideology, to the classical Roman town planning , with the addition of elements of the Italian Rationalism. An important example is the Palazzo della Civiltà Italiana. Another building, symbol of the EUR district is the Palazzo dei Congressi. Thanks to the application Eurtour you could make a virtual tour among the most characteristic places of EUR, for example the famous artificial lake. The following museums are present at the EUR: Museo dell'Alto Medioevo (Museum of the Middle Ages), Museo Nazionale Preistorico Etnografico "L. Pigorini (Prehistoric Ethnographic Museum), Museo nazionale delle arti e tradizioni popolari (National Museum of Arts and Popular Traditions), Museo della Civiltà Romana (Roman Culture Museum). At the intersection between via Chiana and via Tagliamento we find one of the few bars- tobacco shops that are open on Sunday in the Trieste District of Rome. Therefore, as we are blinded by the physical need of nicotine/caffeine, we pass through the area without paying attention to the surrounding buildings, to the surreal atmosphere in which we are absorbed. Nevertheless it is sufficient to glance up for getting lost between akin-medieval towers, Baroque emblems, decorations with a retro taste. The suggestive area is situa ted at the gates of the centre, to embellish one of the most elegant areas of the Capital and, at the same time to interrupt the ordinariness of the building code. 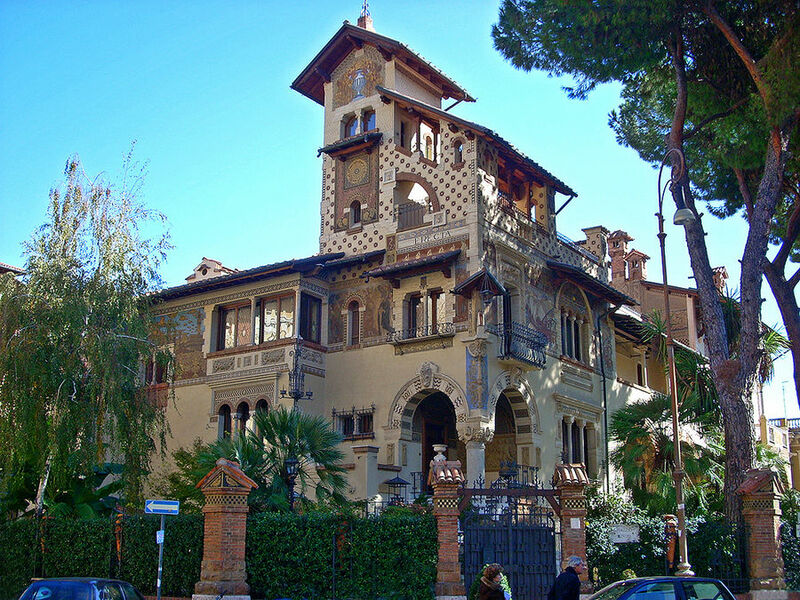 Seventeen little villas and twenty-six palaces between via Tagliamento and piazza Buenos Aires constitute the Coppedè District, named by the Florentine architect-sculptor Gino Coppedè who, selected by the Cerruti officers of the society «Edilizia Moderna», realized it between 1913 and 1921. The long stopping of the works during the first World War and the death of the architect in 1927 didn’t allow the accomplishment of the original project, that concerned the building of a real district and that, stayed therefore uncompleted, it shows as a small suggestive corner that represents with its variety of styles many historical periods . The District opens up triumphantly with the majestic and sometimes somber entrance arch that links two palaces and where the symbols and typical elements of the Renaissance, Gothic and Barroque mix together and gave rise to a kind of temporal suspension. To challenge further the sense of time and reality, an enormous chandelier of beaten iron placed under the arch. Two towers lavishly decorated with badges, statues and balustrades are on top of the arch. Above the tower on the right we can admire a sacred aedicula that contains an image not attributable to the classical Christian iconography: a Madonna with Child. The Child doesn’t look at his Mother but at one ideal pedestrian, like a kind of welcome. Going along via Brenta we arrive at the core of the district: Piazza Mincio. In the middle of the piazza, in 1924,the Fountain of the Frogs (it is famous the image where the Beatles took a bath with its clothes after a night spent at the Piper, Roman discotheque), was placed in such way that the above-mentioned chandelier and the Villa of the Fairies can be admired from it, another characteristic element of the building complex. The basins of the fountain are populated, by frogs: four in the lower basin, that sprout water in the shells sustained by the four couples of figures, and other eight that, on the edge of the upper basin, seem ready to jump to ward the central jet. In this atmosphere of childlike fantasy, full of classical reminiscences, the artist didn’t forget to give a personal tribute to the city that hosted it and to the art that made it magnificent. Therefore the bee on the edge of the basin is an affectionate and grateful reference to the Fountain of the Bees by Bernini. Among the other most famous buildings the mentioned Villa of the Fairies and the Russian Embassy stand out. The Villa of the Fairies, fairy building delimitated by a refined wooden and beaten iron railing, shows an architectonic space modulated by irregular galleries, stairs, arcs and eaves. The walls show several and different decorations whose topics include fields of flowers and urban images, typical medieval histories and geometrical figures. Also the materials used for the building of the external face are promiscuous: bricks, marble, glass, terracotta, travertine. The surrounding vegetation composed by bushes, palms and tall trees, together with the columns and the capitals, create some suggestive light-shadow effects that contribute to give a fully surreal atmosphere to the place. The Russian Embassy, valuable turreted villa with a great gallery, shows neoclassical, medieval and Christian elements combined with apparent incongruity. The badge is decorated with typical images of the ancient Greece while the roof is sustained, as a gutter, by great statues portraying animals. In a corner of the tower we find instead a holy aedicula, placed so high that it isn’t nearly visible. The creativity of the artist makes tracks in the area, with its pastiche of styles and its Liberty style is improper. Improper because is inspired by the Nature imitating the figures in order to embellish and to ennoble the houses but, at the same time , he puts together in an excessive way the most peculiar features of the different artistic periods. Anyway, Coppedè’s style hasn’t really so far neither antecedents nor successors, although it can be connected to the term Neo-eclecticism . The Neo-Gothic enchantment evoked by the buildings and the nightly ghastly atmosphere have inspired several movies. Rebuild faithfully in the scenic design of “Cabiria” (Pastrone, 1914), the Coppedè District has certainly charmed the horror director Dario Argento that used it as a location of two of his famous full-length movies: “Hell” and “The Bird with the Crystal Plumage”. The strange suicide of the architect, dead when he was only fifty years old increased the feeling of fear and mystery concerning this area. He left many works uncompleted and with traces of Satanism that, for some schools of thought, has become the reading key of some of his eccentric works . The history of Garbatella District originated during the first post-war. The important architectural development of the city of Rome at that time promoted the building of the first workers district of the city, that developed on the hills overlooking the Basilica of Saint Paul Outside the Walls. The district was originally characterized by an architecture on the model of the Garden Cities, that included big green cultivable areas in order to offer a further resource to the workers living in the area. However, under the Fascist government the green areas were reduced and the houses weren’t built as villa anymore but as apartment blocks. It was still present the idea of a coexence between houses with gardens and orchards. The hypothesis about the origin of the name Garbatella are very intriguing . According to one of the hypothesis the name of the district comes from the characteristics of a, “courteous” and “beautiful” innkeeper who entertained with her polite manner the guests of the inn, at Via delle Sette Chiese . Another theory sees the roots of the name in a local wine-growing called “a barbata” or “a garbata”. It is worth visiting, in the Garbatella district , the Catacombs of Commodilla with their basilica, the Church dedicated to the saints Isidoro and Eurosia and the Church of San Francesco Saverio alla Garbatella. You can reach easily the district through the Line B of the underground, getting off at the stop Garbatella. San Lorenzo was built between 1884 and 1888 in Rome. At the beginning there was no intention to built a working-class district; it was the housing crisis broken out in the years between 1888 and 1890 that led to the neglect or accomplishment of the buildings, that were used as loadgings for the poorest class of Rome. The name San Lorenzo derives from San Lorenzo Gate, the current Tiburtina Gate. In 1909 a town-planning city-plan was passed, to put the district in order . This was the only district that tried to stop the Marche on Rome, and for this reason it was labeled Red District or Testaccio and other historical districts. San Lorenzo pay the heavy price for that opposition because it was attacked by a punitive led by Italo Balbo. The urban structure of the district, even at that time, had the shape of an extended rectangle, and it is hemmed in by the Labican walls, the cemetery of Verano, Via Tiburtina and the freight yard. 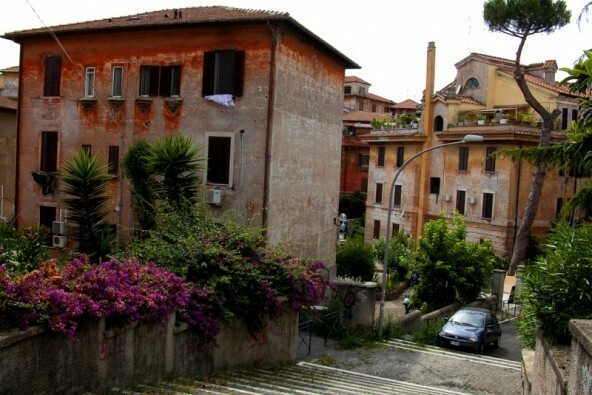 Built outside the Roman walls San Lorenzo has become a village inside Rome. Besides the urban isolation the is also the social one. The inhabitants of the district were of a low rank: construction and railway workers, tramway employees, craftsmen, garbage collectors. This was due to the fact that in the district there was the freight yard, the reservoirs of the main waterworks,the railway depot, the repair shops destined to the construction of the railway transport, the cemetery, and so on. As a result the district of San Lorenzo became a real working-class area. 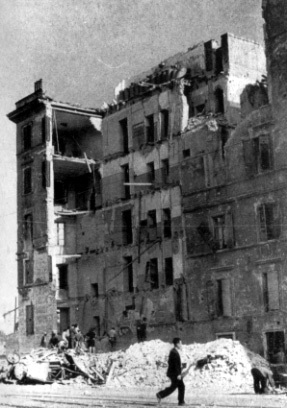 In 1943, during the second World War, San Lorenzo was the most heavily bombed district of Rome, with the aim to destroy the freight yard today still active, together with the districts : Tiburtino Prenestino, Casilino, Tuscolano e Labicano. In the years following the war, San Lorenzo remained a working-class district. San Lorenzo has a leading role in students’ protests and it becomes the site of Lotta Continua and headquarter of the activities of the extra-parliamentary left. Today San Lorenzo belongs to everyone .It is a district frequented by university students , enlivened by restaurants, pubs, wine bars and cultural associations. San Lorenzo is losing its working-class look that had characterized it, even since its origin . It is considered by many people as the most authentically Roman district ,because, even if it isn’t far from the most touristic areas of the city has preserved its characteristic life-style and rhythm. 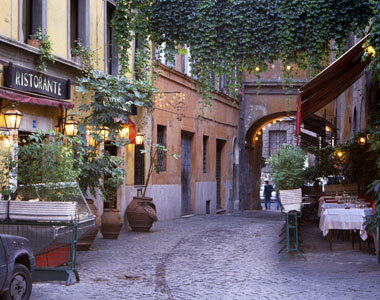 The urban fabric, full of typical places and markets, develops with a great network of alleys around the main piazza of Santa Maria in Trastevere. The Church was founded around 220 A.D. and rebuilt with the addition of the tower bell nel 1138 d.C. by Pope Innocence II and completed, by order of Pope Clement XI, with the portico in front of the façade designed by Carlo Fontana in 1702 d.C.. On the façade you can see some mosaics dating back to the XIIth century, portraying the Virgin enthroned with Child and a procession of ten Virgins; the interior, instead, with columns and capitals coming from an ancient Egyptian temple, is furnished by mosaics and frescos by Pietro Cavallini in the apsis, and also by the ceilings by Domenichino and by the decorations by Carlo Maratta. Near the church of Santa Maria in Trastevere it is also possible to visit the Accademia dei Lincei (Lincean Academy) founded in the first years of the 17th century by Federico Cesi and the Corsini Gallery where many works of the period encompassing the Mannerism, the Baroque by Guido Reni, Lanfranco, Tiepolo, Canaletto, Maratta and Luca Giordano are housed. The twelfth district of Rome is called Gianicolense (from the name of the Gianicolo hill, in the Trastevere district , where the first urban expansion in the area comes from), and it is situated in the south side of the city , behind the Aureliane City Walls and the Tiber; it is defined by Aurelia Antica, by the Via Portuense, and by the Gianicolensi Walls that border Trastevere, until via del Casaletto. The district is generally called "Monteverde", but the inhabitants do a further distinction: there is the zone of Monteverde Vecchio (that extends on the mount), and Monteverde Nuovo (that extends on the valley under Gianicolo) and the Portuensi Hills. Besides via del Casaletto there is the Gianicolense suburb , where is settled the Parco della Valle dei Casali and populous hamlets such as Bravetta (or Borgata Villini). Monteverde (and therefore Gianicolo) is part of the last hills on the right side of the Tiber river, as the one of Vaticano or Montemario; the famous "sette colli" of Rome are instead on the other side. Monteverde Vecchio, included by the urban development plan of 2002 in the "historic city", covers an area going from Porta San Pancrazio (along Via Carini, that at its end, opens in Rosolino Pilo square, where the Church of Regina Pacis rises ) to Ponte Bianco (a bridge of twenties that allows to the gianicolense ring road to overtake the railroad Rome-Viterbo), to via Vitellia, via di Donna Olimpia and Trastevere avenue . Instead Monteverde Nuovo, goes on over Donna Olimpia road to reach the Portuensi Hills. These area, initially inhabited by rich people, during the Fascist period hosted many displaced persons (the housing project in Donna Olimpia Road was made for them) and the construction of the San Camillo hospital contributed to attract middle-class (doctors, employees and professionals). Visible staying in hotels in Gianicolo, the district offers many tourist attractions: only needs to think to the Christian Catacombs of the Basilica of San Pancrazio ( where there were also Jewish Catacombs called of San Ponziano ), or also the wonderful villa Doria Pamphilj, the largest public park of Rome. The district that became famous also thanks to the Pasolini movie "Ragazzi di vita" ,hosts many famous persons as politics , actors, singers and football players. In the Gianicolense district also exist many cultural institutions such as the Accademia Americana in Roma ( American Academy in Rome in villa Aurelia ), the "Grande Oriente d'Italia" headquarters of the executive body of the Freemansonry that has its seat in the villa "il Vascello", and the "Vascello" theatre very important in the cultural life of Rome . The District of Vittoria, in the early 20th century, extends towards north-west with a great range of services: sports and between these services there is the “Foro Italico”, administrative services as the Ministero degli Esteri, legal as the criminal court of Piazzale Clodio, housing as Youth Hostels, and of telecommunications as the Rai at via Teulada. This development was made during Fascist Period and went on during fifties. At piazza Maresciallo Giardino ended viale Angelico, that at the time extended to Milvio bridge . Over the Tiber a large marshy area developed during the Fascist period that was chosen by Enrico Del Debbio for the project of the Foro Italico. In 1929 the project started, and until the fall of the regime was called Foro Mussolini. In front of it a very big obelisk with the name "Mussolini" carved on it rises. In 1927 De Debbio started the buiding works of the Academy of Physical Education today seat of the offices of the CONI. The first building that you can see is the Foresteria Sud, today seat of the Youth Hostel, that was realized by De Debbio in 1930. 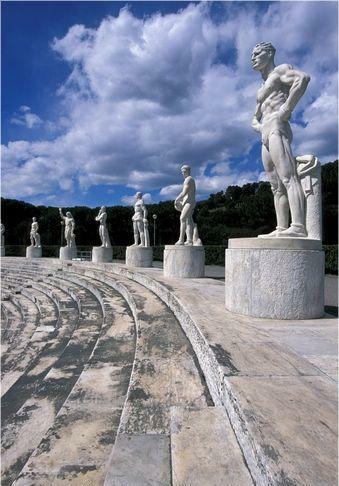 At the viale delle Olimpiadi there is the Casa or the Palestra delle Armi or della Scherma (Academy of Fencing), built in 1935-36 under the design of Luigi Moretti, and decorated by the mosaics by Antonio Canevari, in it many trial were conducted. Going on, we find the Swimming Stadium, completed in 1960 and realized under the design of Del Dobbio and Vitellozzi; then there is the Tennis Stadium, ex complex of the Racchetta or Pallacorda, realized under the design of Costantino Costantini between 1933 and 1934. 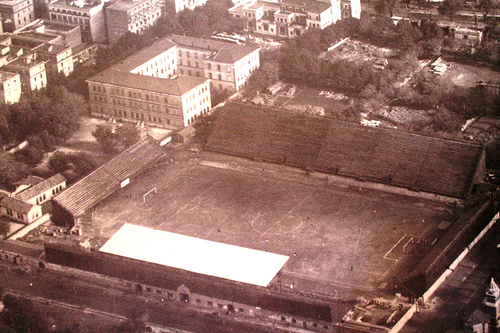 The same Costantini realized in 1937 the Stadio delle Terme that rises north the swimming pools. On the square there is an obelisk and in front of it there is the Duca D'Aosta bridge. Along the Lungotevere Maresciallo Diaz there is the Palace of Physical Education by Del Dobbio, realized between 1927 and 1932, current seat of the CONI. There is also the Stadio della Farnesina that can hold five thousands seats. We find also some buildings and the Casa Internazionale dello Studente realized between 1957 and 1960 by Del Dobbio and Lugli. Overlooked the Tiber the great building of the Farnesina rises , that replaced the old shooting range and still before a French and Papal military camp of 1864. It is situated south the Aventine Hill and on the left bank of Tiber River, it is different from the other districts of Rome because it was able to preserve, its original popular spirit over time, in opposition to many other areas of the centre of Rome that, today, have lost their familiar and characteristic atmosphere of real Rome. Testaccio could be defined "a village inside a city" that is Rome. Notwithstanding the development, the district is, as far as possible, simple in its life-style and on a human scale. The district is already famous on its own, but it is known in the Roman circles also for a very special thing: it was in the Testaccio district, that the football team of Rome, during the thirties, had football pitch... the "Campo Testaccio"! The Ghetto was situated in the rione Sant’Angelo, where the Roman Jewish Community settled down since the 14th century, after they had lived at Trastevere and at Isola Tiberina. In this zone, in 1555, pope Paul IV instituted the Ghetto, with a wall and three gates; inside it 2000 people lived, the number of the components of the Jewish community. The Ghetto was successively enlarged and two gates were added, that like, the other gates, were opened at dawn and closed at sunset and can be crossed only by whom has a special permission. The hygienic conditions were terrible, with frequent plagues for lack of public fountains, therefore the Jews drank rivers water for much time. 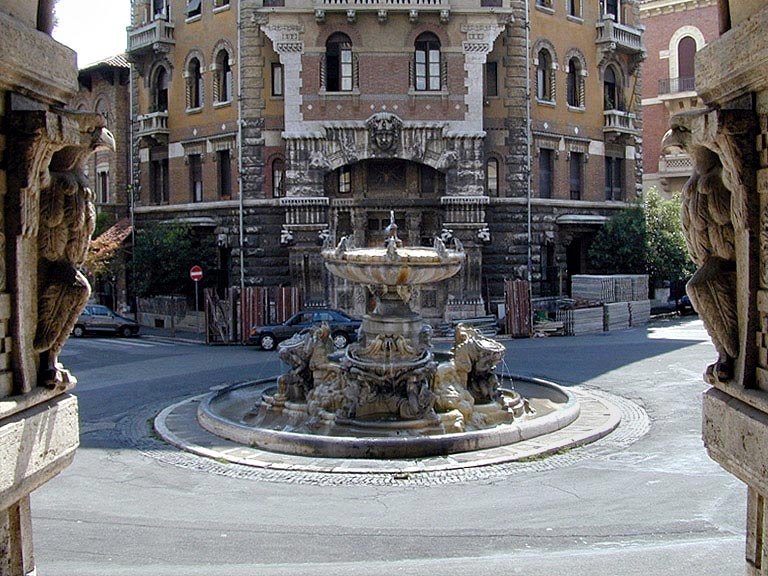 The "Fontana del Pianto" (fountain of the crying), built in 1591, was the only water spring of the Ghetto. The houses rose on few open spaces, or between alleys, forced to rise with banking, crossovers, stairs, galleries, that were insufficient to house a growing population. The population, indeed, grew from 3500 at the end of the 16th century to 9000 at the end of the 17th century. Synagogue: It is also known as “Tempio Maggiore”. It is one of the great synagogues of Europe. 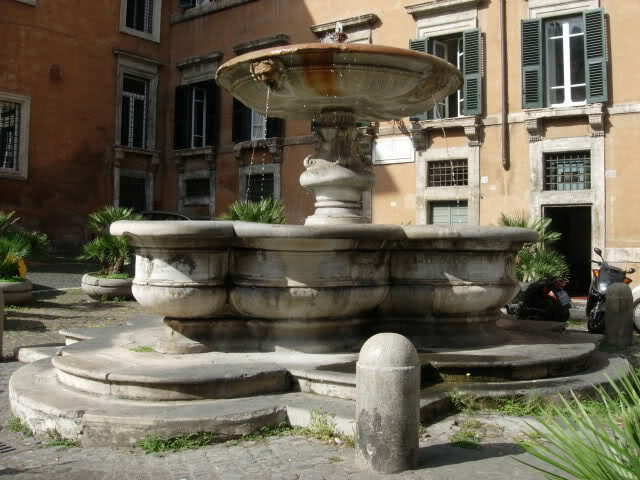 It is situated exactly at Piazza delle Cinque Scole, near the Tiber. The building and position were chosen by Victor Emmanuel II (after the Italian Unification in1870), granting citizenship to Italian Jews and the permit of rebuilding the Ghetto of Rome, but with the establishment to the Jews of 2 main conditions. First, the place, obtained from an area situated between two symbols of the “recognized Roman freedom”, the Capitol (with the monument to Victor Emmanuel II), and the Janiculum, a place of bloody wars of Risorgimento (with the statue of Garibaldi). The second condition concerned the dimensions of the building. The style of the building is assyro-babylonian, the dome is decorated with oriental motives. It’s a very important place for the Roman Jews, it is used as a prayer place and as a cultural reference. It is made up of two floors, one is underground, where is situated the Jewish Museum and a Little Synagogue (called Tempio Spagnolo) furnished with parts of the five “scole” (schools), as a tribute to the 5 synagogues, which were in times past in the ghetto (Castilian, Catalan, Sicilian, Nova, and Italian), this promoted the introduction in the rites of the people coming from different places. On the ground floor the “Great Synagogue”, it is a great room, divided by side naves. After the attack of 9 October 1982, by a Palestinian commando, which caused the death of a child who was 2 years old, and the wounding of 37 people, it is controlled 24 hours over 24, but is possible to visit it from Sunday to Thursday.